You are most likely looking for a free website design template that you can use to build your own cleaning business website for your cleaning service. The DIY approach is often commendable, but your cleaning business website may not be the best place for that particular creative impulse. Here are five reasons that building your own cleaning service website is a less-than-perfect idea. Even worse, is the urge to use a pre-designed template from a place like Vistaprint. Their templates tend to commit the design errors listed below. After all, they were not written by successful cleaning professionals. They were written by web programmers. They always do, and everyone knows what that certain look indicates – it's cheap! What message does your website convey to people who are considering hiring your cleaning services? Do you convey the idea that your business is stable and successful by having a cheap-looking, free-template website? People often assume that website design is easy to do, you just dash it off. That is just not the way it works. Like a great theater production, websites are about performance. Good ones usually register in your mind as good because of all the work behind the scenes that you don't see, and are blissfully unaware of. 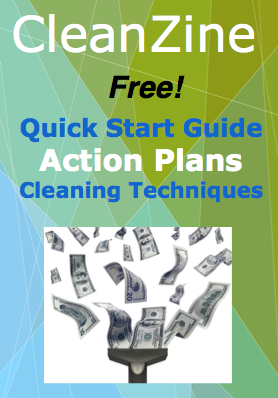 You are likely to optimize your cleaning service incorrectly. You have undoubtedly heard of SEO (search engine optimization) and you are already planning to add keyword terms such as, "cleaning service," and "home cleaning," to your meta-tags, title-tags & alt-tags. Don't know what I am talking about? Then definitely do not build your own website! Those keywords will not do you much good. The chances of your website ranking for "cleaning service" are about as likely as winning the state lottery. How many web pages rank for that term? Let's look. On Google today, it is 180,000,000. Think you are going to get on page one for that? You need SEO that is specific for your area and that specifies your services within a local context. You need to test which keyword combinations are likely to work for your unique situation. An example may be, "Antioch upholstery repair.” For that to work at all, you need relevant links from other relevant websites in the area that are about that topic. The message is vital – Are you a good writer? The number one mistake I see with cleaning business websites is that the owner goes on and on about themselves and their qualifications. The visitor wants to know how they benefit from your services, not that you perceive yourself as the best. Every cleaner thinks they are the best. The visitor seeks reassurance that, for their money and trust, they would get a clean and peaceful home to return to, that they will be treated well, and that they will feel better about themselves and their home. They are not interested in you! Why do you want to work for people with very little money? Quit trying to prove yourself to people who cannot afford a cleaning service! If your website is well written, looks sophisticated, performs above average and it's a pleasure to navigate, you are more likely to be hired by successful people who can afford to pay the fee you ask. If your website is a cheap-looking template site, it will attract bargain shoppers. Read the small print. For example, if you buy your website from an online builder such as Wix or Weebly, they may not transfer your domain name if, in the future, you decide to switch to another service. Please take a look at our portfolio to get an idea of what quality cleaning-service website design looks like. We build each website from scratch. We do not use a one-size fits all cleaning service website template. And we have professional writers on staff to write your text.